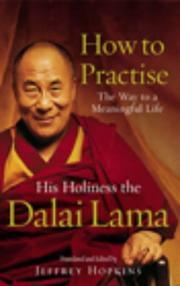 How To Practise is a major inspirational work, by one of the world’s greatest spiritual teachers. It is broken down into the basic steps to enlightenment: how to practise morality, how to practise meditation, and how to practise wisdom – at the same time, delving deeper into His Holiness’ more general Buddhist teachings, his spirit, wisdom and sense of humour. The book, meant to be used as part of daily practice, is easy to understand and filled with anecdotes. It includes guidance on mental calm, altruism and compassion, refraining from harm, focussing the mind, and much more.